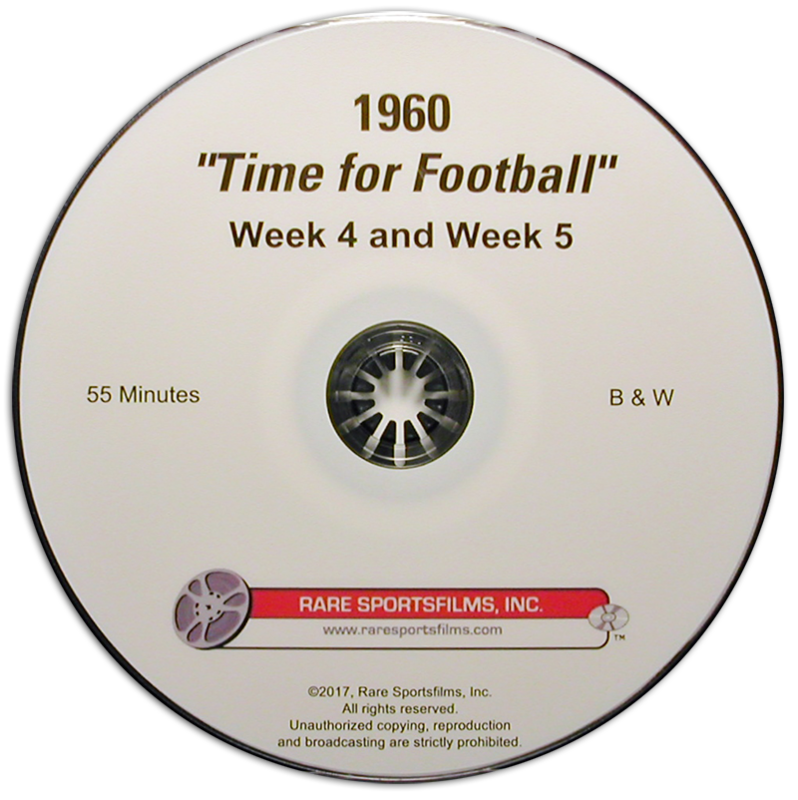 In the years before NFL Films was born, the made-for-TV show "Time For Football" covered the NFL action each week throughout the fall. Each weekly Black & White TV show ran almost a half hour and featured the big plays of every game. Here are two of these shows (55 minutes running time) from the 1960 season - Weeks 4 and 5. Filming was done by Tel Ra Productions of Philadelphia, and narration in 1960 was by sportscaster Jim Leaming. Below is a brief description of each game. All players listed below are actually named in the narrative, with many others also shown. Browns vs Cowboys at the Cotton Bowl - Halfback Bobby Mitchell scores three touchdowns (one a 90-yd second half kickoff return) and Larry Stephens returns an interception 34 yards for another TD as Browns overwhelm first-year Cowboys 48-7. Jimmy Brown, Gern Nagler and Jamie Caleb also score for Browns. A Don Heinrich to Billy Howton 12-yd TD pass is only Dallas score. Bears vs 49’ers at Wrigley Field - Two TD runs by Johnny Morris, J.C. Caroline’s 57-yd fumble return and an Ed Brown to Will Dewveall 91-yd TD pass (longest in Bears history) help Chicago beat San Francisco 27-10. J.D. Smith’s 34-yd TD run and a Tommy Davis FG are only 49’er scores of the day. Eagles vs Lions at Franklin Field - Two TD’s by Clarence Peaks and two Van Brocklin touchdown receptions (Ted Dean and Bobby Walston) pace Eagles to win over Detroit. A Jim Martin FG and a 17-yd interception return by linebacker Joe Schmidt for his first career touchdown highlight Lions effort. Colts vs Rams at Memorial Stadium - Lenny Moore has great game with four TD’s and Steve Myhra adds FG as World Champion Colts beat Rams 31-17. Los Angeles scoring is on Jon Arnett’s TD run, a Billy Wade QB TD plunge and first quarter FG by Lou Michaels. Johnny Unitas tosses TD pass in 41st. consecutive game! Steelers vs Cardinals at Forbes Field - After Bert Rechichar’s two first quarter FG’s), Tom Tracy and Buddy Dial add TD’s as Pittsburgh leads Big Red 20-0 in third quarter. John David Crow TD run and Frank Mestnik TD cuts Steeler lead to 20-14, but then a late Bobby Layne to Jimmy Orr TD pass seals Pittsburgh win. Redskins vs Giants at Yankee Stadium - This was the most exciting game of the week (we also have nearly an hour of this game available on another DVD - it is the oldest existing kinescope of an NFL game)! Trailing 17-3 at halftime (Summerall FG, Gifford TD run and Shaw to Rote TD pass), ‘Skins stage big comeback. Don Bosseler and Johnny Olszewski score TD runs (with another Gifford TD run for Giants in between), and Washington is now within 7 points with less than a minute to play. After Redskins recover desperation onside kick, Jim Podoley’s TD reception from QB Ralph Guglielmi ends the game in a 24-24 tie and spoils Giant’s four-game win streak! Bears vs Rams at The Coliseum - Two Zeke Bratkowski to Angie Coia TD passes, including one with less than a minute left, help Bears tie Rams 24-24 (also TD by Will Dewveall and John Aveni FG). An Ed Meador interception return had put the Rams ahead 24-17 in the 4th qtr. Ollie Matson TD plunge and Frank Ryan to Clendon Thomas touchdown pass figure in L.A. scoring. Cardinals vs Cowboys at Busch Stadium - J.D. Crow TD and a safety have Cardinals leading 9-3 at halftime. L.G. Dupre’s TD in final period gives Cowboys hope for their first victory ever, but Jerry Perry’s FG with just 43 seconds left once again dooms Cowboys to defeat. Packers vs 49’ers at Lambeau Field - Lombardi’s team is starting to look like a club to be reckoned with, as Packers pour on the points vs hapless 49’ers. Paul Hornung (FG also), and Tom Moore tally two TD’s each, and Max McGee has TD pass reception, as Green Bay beats SF 41-14! Only 49’er points come on Tittle TD passes to J.D. Smith and R.C. Owens. Steelers vs Redskins at Griffith Stadium - Tied both at the half (10-10) and at the end (27-27), Bob Khayat’s late FG saves ‘Skins from defeat. Exciting, back and forth game all the way! Lions vs Colts at Briggs Stadium - This 30-17 win over the Champion Colts is the upset of the year! Baltimore leads 17-10 at the half, but winless Detroit holds Colts scoreless entire second half! Lion QB Jim Ninowski’s TD run ties game 17-17 third quarter. Two Jim Martin FG’s and an 80-yd interception return by Night Train Lane clinches the game! Eagles vs Browns at Municipal Stadium - This big game was another thriller. Jim Brown’s TD to begin the second half gives Cleveland nice 22-7 lead, but two TD’s by Billy Barnes and a Tommy McDonald TD catch put Eagles up 28-22. Then, a Plum to Mitchell TD pass seemingly gives Browns 29-28 victory, but Bobby Walston’s 38-yd FG with just 16 seconds left gives Eagles early-season revenge win!